After my stopover at HQ this afternoon, I don't see any plans on getting VII series. They still need to bid for VI engines, last time I checked. 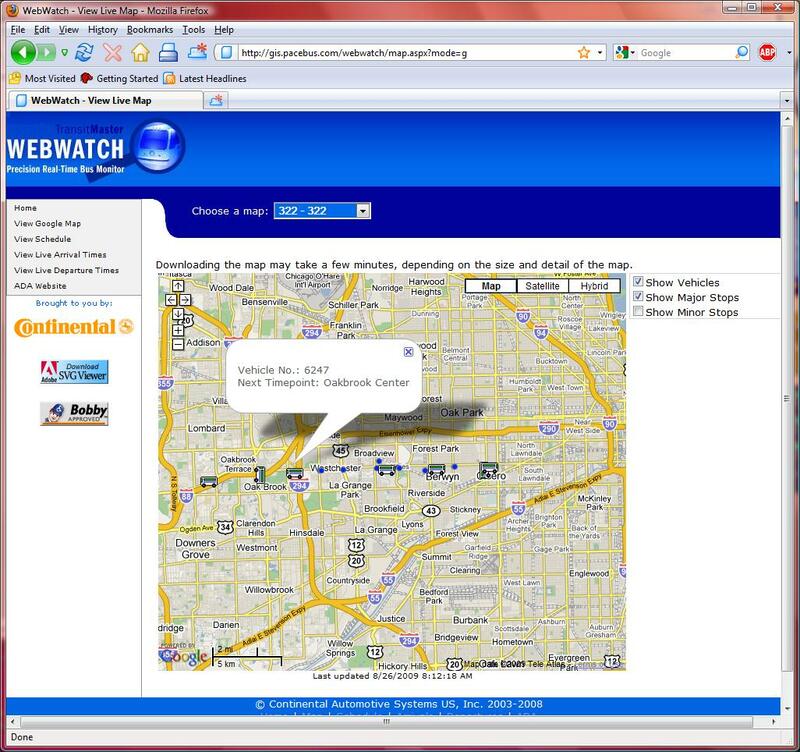 6247 shows up on WebWatch on 322. Nothing else at West on WebWatch seemed out of range, but I had a feeling that there were a few fewer 6000s showing, until I hit 747, which was running mostly them. Nonetheless, to add to the speculation thread, if Pace is trying to keep types together, could also move more NABIs from Joliet to West and some Orion VIs from West to Northwest. That's what I would think too until I saw #6052 on route 379 last week, normally a Pace West bus. Don't know if it was a loaner or if it's moved to SW. Supporting one of your theories, 6671 apparently got shifted from Joliet to Waukegan. Update: Also physically seen by me on route 272 Thursday night. Tangetially related, 2703 apparently got shifted from Aurora to Elgin. I don't think that bus was from Aurora because I know those buses have early 2600s. Unless it could have been from Naperville or Westmont because the Eldos at Westmont/Naperville all are 2667 and later. In fact, 2701 runs the Western Springs Metra feeder. Yep, but 2702 and 2703 were consistently in Aurora, up to now. Also, a sighting by a member here, and a post by a bus driver who had access to the South Holland facility here. I've seen 2702 on route 530 (physically). I hadn't seen 2701, but figured it was on the Western Springs contract (had seen 2699, 2700). 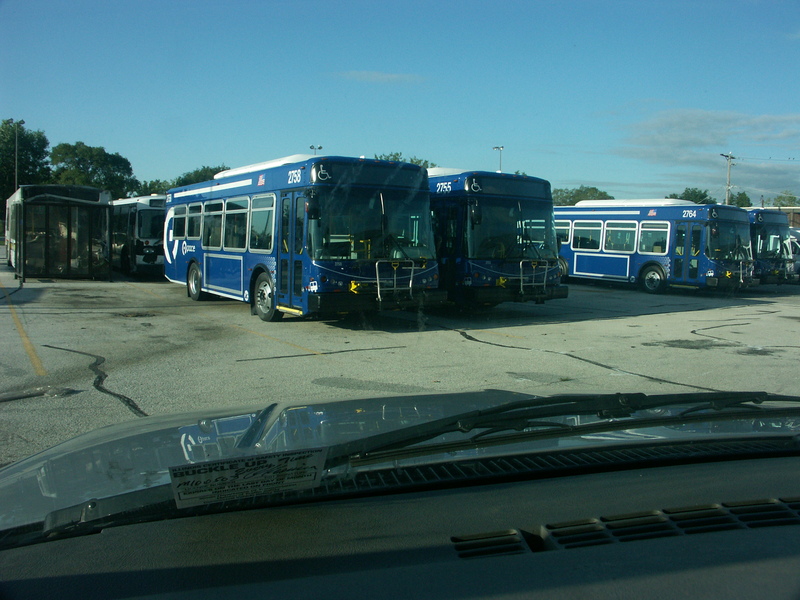 According to the contract, 3 buses were assigned between Hinsdale and Western Springs. McHenry has 2696-2698 (I personally saw 2697, 2698). 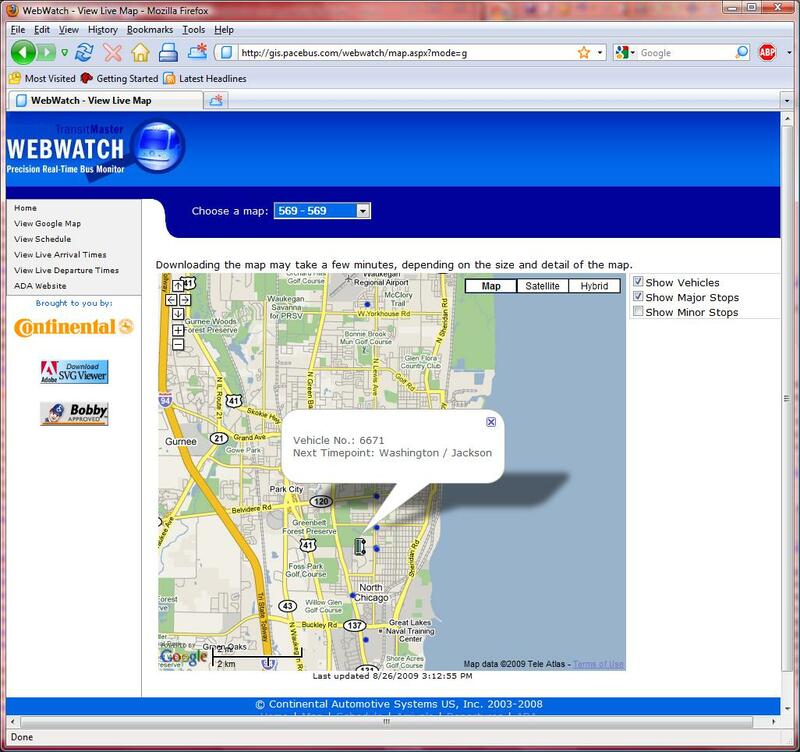 Just curious about something, I saw #6259 on Webwatch on a north route (I think coming from Evanston). 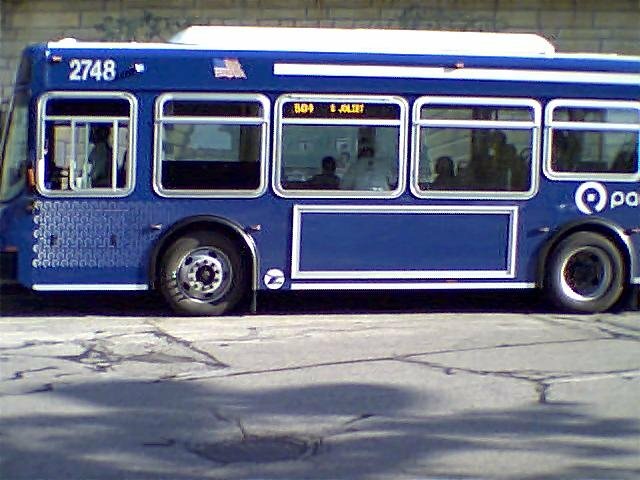 Anybody know if this bus is painted blue? I know all the 6161-6256 Nabis are painted with original Pace colors and I know 6261-6321 is painted with the new colors, but I don't know about 6257-6260. 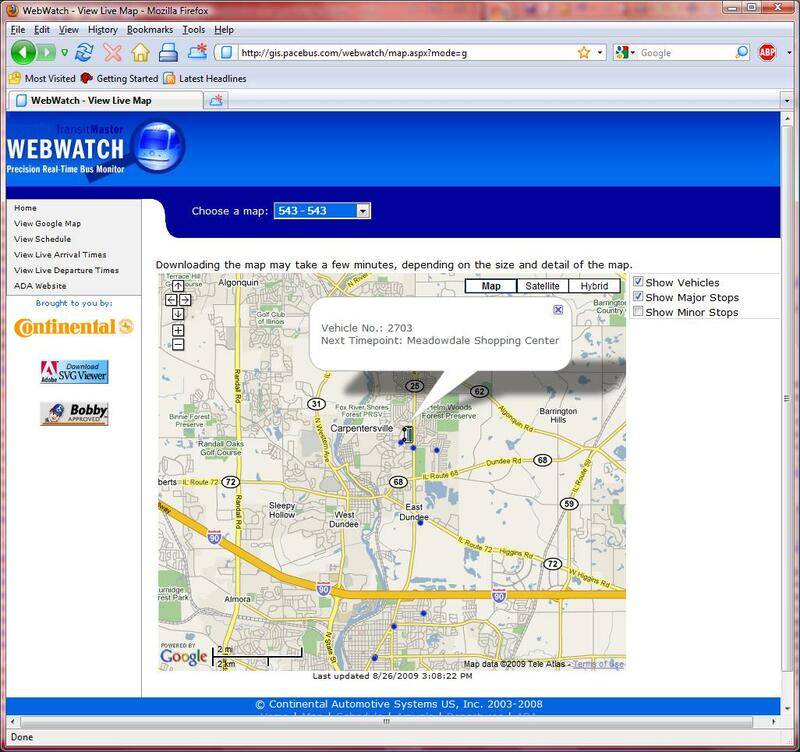 Just curious about something, I saw #6259 on Webwatch on a north route (I think coming from Evanston). Anybody know if this bus is painted blue? I know all the 6161*-6256 Nabis are painted with original Pace colors and I know 6261-6321 is painted with the new colors, but I don't know about 6257-6260. White through 6261. First blue one is 6262. Through 6261 were originally in Joliet, but were traded with North Shore for 6624-6628 and a few that went from Highland Park to North Shore.6261 was the last of the 2003 order, while 6262 started the 2005 one. North Shore blue NABIs are 6262-6267 and 6322. *Also, 6161 is an Orion VI. First NABI is 6162. This is all the buses I physically saw downtown or on my way to/from downtown. This doesn't include what's on webwatch, but we already know 6252, 6254, and 6256 is down there also. Haven't seen 6255 lately, maybe be in repair or moved? Observation 1: routes 504 and 507 cannot be pulled from Webwatch, but only 1 bus runs 504 and 507 where as 2 buses run 505 (6674 and 2748 are on that route today). But keep in mind I was down there around lunch time, rush hour probably pulls out additional buses. Observation 2: Unless there's a bunch of people that get on during rush hour, these buses can easily be Eldos. Some routes had maybe 3-5 people on them. The 2 excpetions is the 501 (was very heavy at noon) and 507 (the Louis Joliet mall route which was also somewhat heavy for a midday, hence why 6253 was there earlier). Of course there's also the 834, but that's spotty at best because you don't know what you're gonna get once you leave Joliet. Conclusion: No question 2743-2749 are at Heritage and they are brand new, no advertising on any of those buses so that had to have come within the last 2 weeks. Also there are 6667-6675 & 6250-6256 at least. It's hard to say what Pace will do, but either they will leave Heritage as is and send the Eldos somewhere else, or take all the 30 foot Nabis and put them up north and bring the new Eldos to Heritage. The 40 footers need to stay mainly for the 501, 507, and the occasionally busy 834. It would also seem to me that if one route has an Orion VI and a Eldo on it at the same time, that both buses should be Eldos so that the Orions can be used on the heavier routes (250, 290, 208, etc). One correction on the listed bus #s,the 6100,6200 series busses are 40'(NABI),the 6600 series are 35' busses(NABI),only the ElDorados are 30' busses. My bad, I just noticed it too. All the 6600s are indeed 35-footers and the rest of the Nabis are 40 footers. I think all the Heritage buses should, and eventually will, be Eldorados with the exception of 6250-6256. I think the next batch of buses should be sent there, send the 35 foot Nabis to replace some of the Orions at the Metra feeder routes from Westmont (Lisle, Clarendon Hills, etc. ), maybe the 2 or so that are still in Naperville. Then take the rest of the Eldos up north. 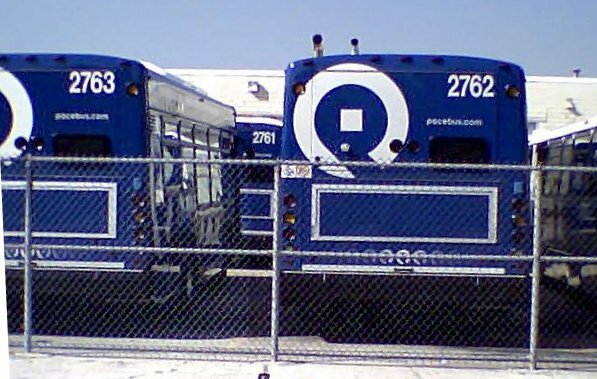 Now this will result in a bunch of bus swapping between Evanston and Des Plaines garages because they've got to determine which routes warrant 40 foot buses and which just need Eldos. Elgin, Aurora, South and West garages will be left alone; SW we'd have to wait and see because I think they can get away with Eldos too, but there probably isn't an urgency to do that until the Novas are next up to be gone. Waukegan will get rid of their Orions and replace with some of Joliet's Nabis and Academy will probably see more Nabis in the very near future too. In reality though, since 30 is the new 40 (footers) and since there is an urgency to get rid of the remaining 93 Orions still up in the north and NW burbs, I think Pace will start there 1st so they can be flushed out, do the bus swapping, and any Eldos that may be left, they will send them to wherever they are needed. Given academy has only 7 Orions left, Waukegan has about 6, and Wesmont/Naperville has around 8 combined, that's about 21 Orions. There's more than that at Evanston and Des Plaines garages and if Pace is getting 58 buses, they'll be short NW and have to keep Orions at those garages which I know they don't wanna do. So I think option 2 is what they will do. But it's just an observation. While I said a couple of weeks ago that it didn't look worth it to go to South Holland, I did so today, and it was. Also, went to Joliet and saw 2750 on 507, not previously reported. 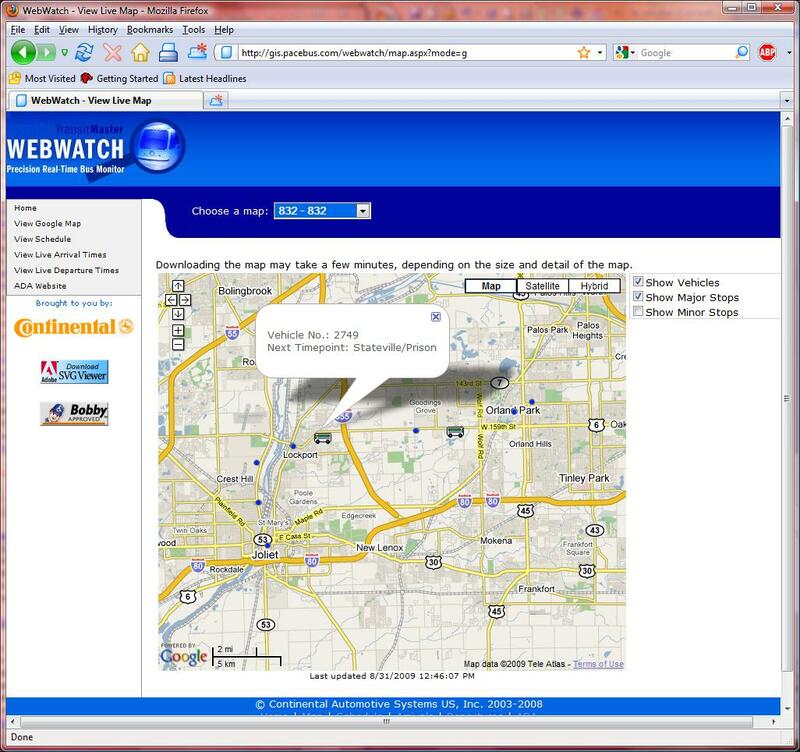 Also a picture of 2748 on 504, which isn't on WebWatch. 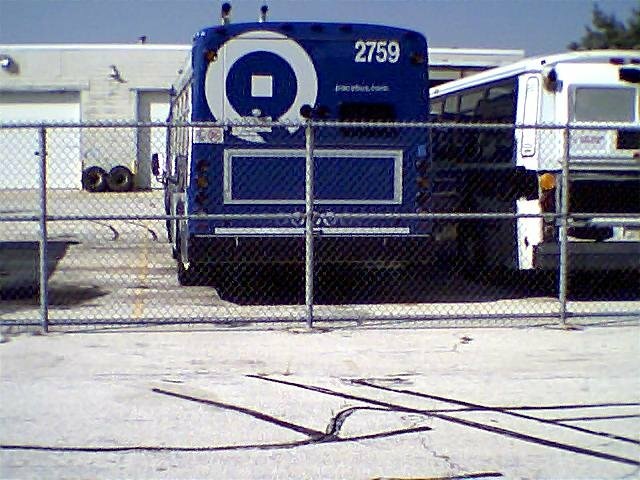 2749 was on 509, and it appeared that the center panel of the headsign was already defective. 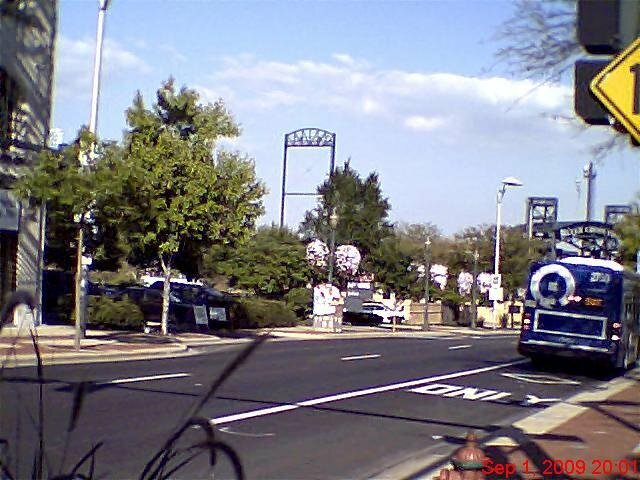 The last picture was a little rough (cheap Walmart camera, but at least the driver loaded). I didn't see any recovery.gov or TIGER stickers, so I don't know what the status is of this order, and hence, as previously mentioned, whether more than #2799 show up. Also, no vanity number license plates (they were in the M179XXX range, instead of the M18274X s). Yes,here is a picture of some of the new ElDorados@South Holland getting ready to hit the road.In the background is an old Orion I(#2047) waiting to be scrapped. Wonder where these Eldorados are going? And what bus is that right next to the old Orion bus? Looks like a Nabi that had a really bad crash. I guess a 2nd bus comes out on 507 during rush hour, but that's shows the inconsistency of planning for crowds. Monday 6253 is on 507, but now today 2750 is over there? I don't get it. Seems to me if all that's the case, maybe Joliet needs to just keep all Eldos and send all the Nabis to where they are really needed. And I didn't know 6241 was gone...I remember riding that bus in Forest Park. That's the one that was specially painted white/blue only. Could also explain why some Joliet buses were moved to West if 6047 and 6241 are gone. 6241 was repaired since that post and sent to West (different logo noted here). 6047 (more exact, the burnt shell of it) has been at South Holland at least as long as 6173, and pictures of it were on other sites (links apparently now dead). I should have mentioned that I stayed in Joliet for 40 minutes. The runs leaving the courthouse at :40 on 501 and 507 were 2700s, while those that left at :10 were 6200s. Of course, the only meet with other routes at the courthouse is at :10. Now that you mention it, when I got to Joliet the other day, it was just about :40 past the hour and I did see only one bus down there (a 501) so it does make sense to make that a Eldo. I didn't see a 507, but I went midday so it probably was running only 1 bus until rush hour. I'm anxious to see where the new Eldos will go once they leave S. Holland. Basically, the South Holland yard had buses in the range 2755-2764 (couldn't verify all from outside the fence). odd, don't you think !!! I think there had to be some kind of order prior to the Tiger. See above, unless you were like pace2322 and cheering it on. Pace had this ready to go long before the funds were released to them, I'd have to think. Those Eldos must have either just recently been delivered or were already at S. Holland but couldn't be sent out. Hence my asking if they were really stimulus buses, and noting that they didn't have the decals. I'm trying to ruminate through the possibilities, such as that they advanced their own capital budget to buy these and are using the stimulus funds to reimburse themselves, or these 20+ are from some other grant, but since they have fooled us before, I'm sort of giving up.